061714: We’re at the Elk’s Carriage House this Friday . . .
Aloooha UFOhana! We’re at the Elk’s Carriage House this Friday. Which means we’ll be doing a pot luck too. Run time 7pm – 10pm. BYOKauKau (Food to Share, a main dish), BYOGear (we’ll have plenty of chairs, but bring music stands, and lights), and of course, BYAloha! For those of you in search of Hawaiian wear and collectibles, Nohea will be there with her goods also. Below: I want to send this out to all you Hula Fans . . . Betty Ann Bruno and her Halau, Hula Mai, are having a hō.ʻike ! Sandy and I have the honor of performing with the Hula Mai Halau Band at this event AND Betty has invited the UFOhana to Kanikapila at the Grinstead Plaza prior to the event, 2p-4p, that day, so come on down and invite your friends too. Mahalo Betty for sharing this wonderful (FREE) event with us! 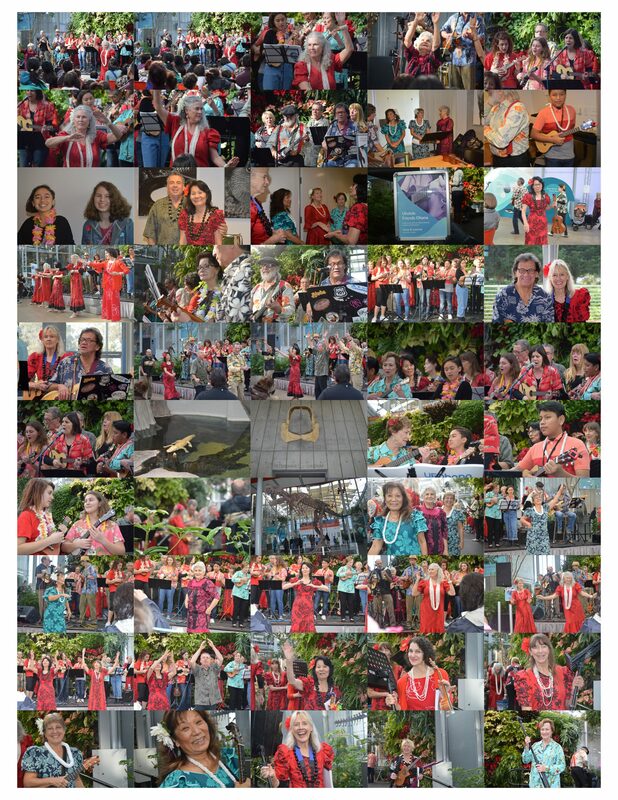 Below are images from this past week’s Ukulele events. Click the collage to view the entire album. Here’s a gang of Elk(sters) and the UFOhana Squadron having a great time at the Elks Lodge . . . Sophie even joined in that night with Momma Wendy who shared her virtuoso Violin playing with us. Mahalo once again to the Elks for being such gracious hosts to the UFOhana! Below: The few, brave and proud UFOhana members that braved the traffic and parking nightmare during the Fairfax Festival. Bass Commander Kimo in full regalia. Below: The Elks Fishing Derby . . . great excuse to throw in a Father’s Day Picnic in too . . .
Below the Whistle Stop Luau where members of the UFOhana performed. Mahalo to Cindy and Sandy for inviting us and to Terumi-san for sharing her wonderful hula. Okidoki . . . it’s back to work tomorrow and as my son, Lucas, use to say (15 years ago) “only 3 more sleepy times” till Kanikapila! 061014: We’re at the Elks This Friday! Alooooooha UFOhana! E’ Komomai (Welcome) to our new Blog Site. It’s still under construction but functional. I’m still in the process of retrieving blogs from 2006. It very nostalgic to view all the past images . . . hard to keep focus on rescuing our memories. We’re at the Elks Bar this Friday. Usual run time, 7p – 10p. A delicious meal will be provided by the Elks for $10. As usual with our Elks Kanikapila; BYOGear (music lights and stands) and always, BYOAloha. Mahalo to Joe Tato and the Elks-ders for hosting us once again! and everything else you might find on a plate lunch…..
Below: Click the collage below for image album from World Oceans Day at Mt. Tam High. The UFOhana were invited to perform there by David McGuire for his non-profit group Shark Stewards: www.sharkstewards.org . Mahalo Nui Loa to the Away Team that helped make it such a fun event and for helping David’s cause. Mahalo to Kurt and John for helping us out on Bass. Great first showing John! Click below for Sleeping Lady Images . . . the Keiki are taking over! And finally, the Friday Night Kanikapila at Campbell Hall . . . Mahalo to Fr. Chip and Sista Linda Lee for hosting us once again at their wonderful Church Hall. We celebrated Adara’s and Wali Wai Wai’s Birthdays. Click the image below for the album . . . Okay, I think that should do it for now. Hope to see you all this Friday or Saturday. Btw, we need a Bass Player for Saturday. Any volunteers out there? Email me at kaleikoa@piko.ws if you can, Mahalo in advanced.